Stop 'Schweddy Balls' Effort Begins : The Two-Way Saying that "the vulgar new flavor has turned something as innocent as ice cream into something repulsive," the conservative group One Million Moms is calling on Ben & Jerry's to stop making the NPR-spoofing frozen treat. Saying that "the vulgar new flavor has turned something as innocent as ice cream into something repulsive," the conservative group One Million Moms is calling on Ben & Jerry's to stop making "Schweddy Balls." One Million Moms wants its members to e-mail Ben & Jerry's "requesting that no additional Schweddy Balls ice cream be distributed." And it wants members to threaten a boycott if the company doesn't do what they want. As Eyder wrote earlier this month, Schweddy Balls (the ice cream) was inspired by a Saturday Night Live skit in which actor Alec Baldwin "plays Pete Schweddy, a guest on a fake NPR show called Delicious Dish. Pete makes holiday treats like cheese balls, popcorn balls, rum balls and his famous Schweddy balls. The skit is an exercise in double entendres." We've contacted Ben & Jerry's spokesman Sean Greenwood to see if the company has any comment. It certainly hasn't changed its mind about Schweddy Balls since the One Million Moms call-for-action went out: Ben & Jerry's website is prominently promoting Schweddy Balls, and Greenwood's voicemail message is as well. Update at 12:15 p.m. ET: Ben & Jerry's spokesman Greenwood tells us the company has gotten "500 to 600 emails and communications ... especially over the last 24 hours," and that "90 percent were saying 'keep doing what you're doing.' "
"Having a sense of humor is one the things we do," he added. " 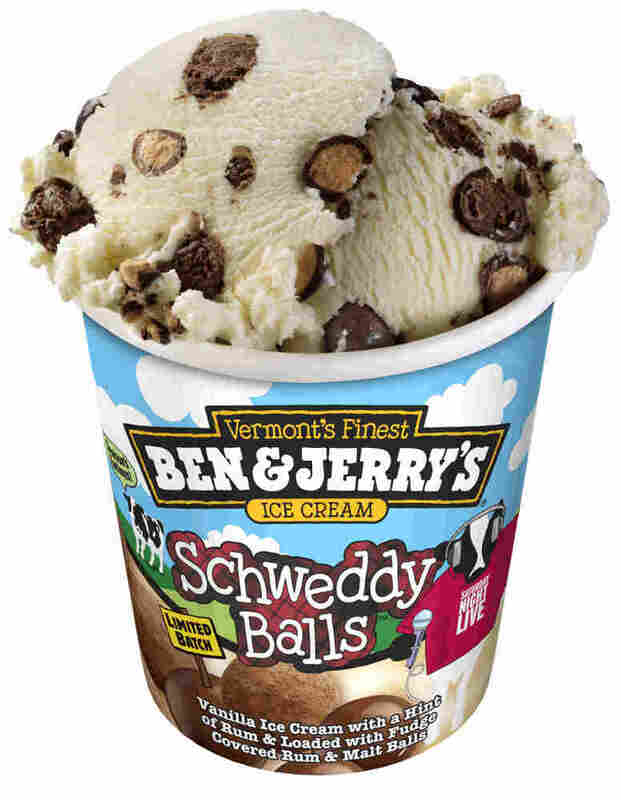 'Schweddy Balls' wasn't named for shock value. It was named after a popular Saturday Night skit." As for the flavor's future, Greenwood said it has been "absolutely crazy popular" and will continue to be produced and sold, as planned, through the holidays. By the way, Baldwin hosts Saturday Night Live again this week. Perhaps Schweddy will be make another appearance?